From Facebook: At left, Republican District 25 State Senate candidate Marc D’Amelio; at right, incumbent State Senate Majority Leader Bob Duff (D-25) and an unnamed supporter. There have been multiple Facebook conversations about signs placed in inappropriate places, with Republican John Flynn accusing the Travis Simms campaign of putting signs on public property, and Republican State Senate candidate Marc D’Amelio on the receiving end of similar complaints. “Campaign signs placed behind the sidewalk are permitted. If there is no sidewalk, signs must be placed at least ten feet from the curb,” according to the release, which also stated that the Department of Public Works collects improperly placed signs and takes them to the Department of Public Works Operations Center, located at 15 South Smith St.
During the 2017 election city officials denied accusations that DPW sign removal favored Mayor Harry Rilling. Norwalk Branch NAACP President Brenda Penn-Williams ran out of time last week in her attempt to confront the Norwalk Board of Education about Chief of School Operations Frank Costanzo’s employment here. Costanzo is the subject of sexual harassment accusations by a New Haven woman. BoE Chairman Mike Barbis enforced the customary three-minute time limit for members of the public, and Penn-Williams’ time had run out amid a confrontation with BoE Chairman Mike Barbis about the “all white” Board of Education. Penn-Williams on Saturday emailed NancyOnNorwalk her entire statement. The statement had more to say about Costanzo, who has been accused of sexual harassment in a lawsuit filed by Chanel Renee Rice in U.S. District Court. “Mr. Costanzo has the responsibility over administering discipline and decisions involving harassment. Board members, have you even asked how he can do this successfully since he does not understand it himself? Can you guarantee this type of behavior will not be an issue in Norwalk? Dr. Adamowski, have you not addressed this because the woman he allegedly harassed is Black? “We are asking that Frank Costanzo be removed immediately. Please hire a qualified and seasoned administrator who can model professionalism and fairness across the board. We keep hearing that you are training Mr. Costanzo as our next superintendent, Dr. Adamowski. The community will not accept that! Norwalk Public Schools Communications Director Brenda Wilcox Williams did not respond to a Monday email requesting comment. Neither did Board of Education members. State Rep. Gail Lavielle (R-143) has been endorsed in her push for reelection by the National Federation of Independent Business, a press release said. “The NFIB CT PAC believes that you will be committed to the needs of thousands of Main Street small businesses and their employees in Connecticut when you are elected to serve in Hartford. Thank you for standing with NFIB on the issues important to small business,” NFIB CT PAC Chairwoman Wendy Traub and NFIB CT Grassroots Manager Sharon Sykes are quoted as saying in a Friday endorsement letter. Lavielle is opposed this fall by Stephanie Thomas, a Democrat. Lavielle, District 143’s State Rep since 2010, is Assistant Minority Leader and Ranking Member of the General Assembly’s Education Committee, and a member of the Finance, Revenue, and Bonding Committee and the Transportation Committees, the release said. She also previously served as Ranking Member of the Commerce Committee. Eversource will present its plans to relocate SoNo’s high tower line, as part of the expected Walk Bridge reconstruction, in a joint meeting of the Common Council Public Works Committee and the Recreations, Parks and Cultural Affairs Committee beginning at 5:30 p.m. Tuesday in City Hall room 231. King said the proposed relocation will impact Veterans Park, hence the joint discussion. At 6 p.m. Wednesday in the City Hall community room, Norwalk Tomorrow is seeking public input on a parking capacity and strategic plan. Walker Consultants will provide an overview and status report, and then the public will be allowed to weigh in. “In order to make sure that parking meets the need of those who work, live and do business in Norwalk, the Norwalk Parking Authority has commissioned an in-depth parking capacity study and strategic parking plan,” the Norwalk Tomorrow website states. Note: that’s at Norwalk High School, in the library. The Committee is touring the school at 7 p.m.
Norwalk Hospital has planned a mixed-use development on the old YMCA property and is looking to acquire two City-owned West Avenue properties. Building and Facilities Manager Alan Lo explained recently that the .44 acres owned by the City, at the intersection of West and Route 1, are appraised at $950,000 and that’s what the hospital will pay, if Council members approve. You’d like this story to include information that you saw on FB. Nancy can’t report information that she doesn’t have. When news happens on FB we usually learn of it from kind people who send it to us. When you see items on FB that you believe are newsworthy, feel free to send links or screenshots to [email protected]. Norwalk’s political parties are still stuck in first gear. Maybe that’s how they “stand up for us” ? There should be a clarification on the following: “If there is no sidewalk, signs must be placed at least ten feet from the curb,” according to the release. 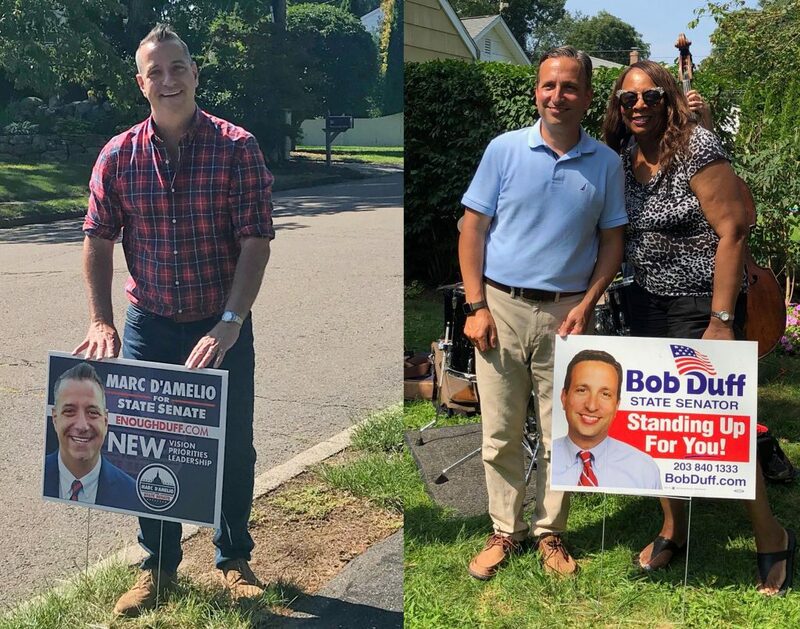 In an effort to be fair Mr. Welch the article states that Republican candidate Marc D’Amelio has been the recipient of complaints on Facebook that his signs have been placed on public property but no reference to any complaints about Bob Duff’s signs being placed on public property. If you e-mail us screenshots of complaints on FB about Bob Duff’s signs in inappropriate places, we’ll add it to the story. The address is [email protected].